Topics | High precision plastic lens | NTKJ Co., Ltd.
Nihon Tokushu Kogaku Jushi Co., Ltd. (NTKJ) will be closed for the New Year’s holiday from December 29th through January 6th. Operations will resume on January 7th. Inquiries via email or our website will still be accepted during this period. Please be advised that all responses will be January 7th at the earliest. Thank you for your understanding, and happy holidays. We do not anticipate any interruption of service due to the above changes. Please do not hesitate to contact RHK Japan or NTKJ with any concerns or questions about these changes. RHK Japan and NTKJ Co., Ltd. are pleased to announce that NTKJ's president and a sales engineer will be attending Photonics West 2018. If you have a plan to visit the Photonics West 2018, we are happy to meet at NTKJ's booth #5049. If you would like to have a technical discussion, please let us know in advance to arrange the time slot. For more information regarding the exhibition including the registration process, please visit SPIE's website. We are very much looking forward to meeting you at the Photonics West 2018. RHK Japan and NTKJ Co., Ltd. are pleased to announce that NTKJ's president and a sales engineer will be attending LASER World of Photonics in Munich. RHK Japan and NTKJ Co., Ltd. are pleased to announce that NTKJ's president and a sales engineer will be attending Photonics West 2017. From 31st January to 2nd February, NTKJ will have a booth at #4935 at The Moscone Center in San Francisco. The booth is situated in "Itabashi-ku" booth in Japan Pavilion. If you have a plan to visit the Photonics West 2017, we are happy to meet at NTKJ's booth #4935. If you would like to have a technical discussion, please let us know in advance to arrange the time slot. For more information regarding the exhibition including the registration process, please visit SPIE's website. We are very much looking forward to meeting you at the Photonics West 2017. Nihon Tokushu Kogaku Jushi Co., Ltd. (NTKJ) is delighted to announce that Fresnel lenses "CF600-0.3M","CF600-0.3M/3T","CF600-0.3/3T","CF600-0.5M","CF600-0.5M/3T","CF600-0.5/3T","CF800-M","CF800-M/3T","CF800/3T" and a lenticular lens "LL0.7-0.5L" have been added to our product line up. Prices of large fresnel lenses "CF250","CF500","CF600-0.3","CF600-0.5","CF700-0.3","CF700-0.5","CF800","CF1200-M" and large linear fresnel lenses "LF500-B","LF1000-BH" have been modified in accordance with the line up addition. Please contact us for details. Nihon Tokushu Kogaku Jushi Co., Ltd. (NTKJ) will be in Year-end and New Year holiday from 30th until 5th of January. Although we are still accepting enquiries via our website during this period, replies will be after 6th January. RHK Japan's office will be relocated to the new place due to Tokyo Olympic and Paralympic Games' reconstruction work around its current office. The new office will operate from the 21st March 2016 at the address stated at the enquiry page. Telephone and FAX numbers will also change. RHK Japan and NTKJ Co., Ltd. are pleased to announce that NTKJ's president and a sales engineer will be attending Photonics West 2016. From 16th to 18th February, NTKJ will have a booth at #4935 at The Moscone Center in San Francisco. The booth is situated in "Itabashi-ku" booth in Japan Pavilion. If you have a plan to visit the Photonics West 2016, we are happy to meet at NTKJ's booth #4935. If you would like to have a technical discussion, please let us know in advance to arrange the time slot. For more information regarding the exhibition including the registration process, please visit SPIE's website. We are very much looking forward to meeting you at the Photonics West 2016. RHK Japan and NTKJ Co., Ltd. are pleased to announce that NTKJ's president and a sales engineer will be attending Photonics West 2015. Nihon Tokushu Kogaku Jushi Co., Ltd. (NTKJ) will be in Year-end and New Year holiday from 27th until 5th of January. Although we are still accepting enquiries via our website during this period, replies will be after 6th January. RHK Japan and NTKJ Co., Ltd. are pleased to announce that NTKJ's president and a sales engineer will be attending Photonics West 2014. NTKJ Co., Ltd. (Nihon Tokushu Kogaku Jushi) is delighted to announce that our headquarter was moved to a new location. As of 1st February 2014, NTKJ's headquarter moved to a new building. New address and phone numbers are stated in "Corporate Overview" page for more details. Nihon Tokushu Kogaku Jushi Co., Ltd. (NTKJ) is delighted to announce that "LF100-30M","LF100-100M" and "LF100-100L" have been added to our product line up. As the product line-up has been expanded, previous LF100 has been renamed to LF100-30S. Please refer to the product pages for more details. Nihon Tokushu Kogaku Jushi Co., Ltd. (NTKJ) is delighted to announce that Koichi Sato, NTKJ's President, will be attending LASER World of Photonics at Messe Munchen in Germany from 13th to 16th May 2013. Koichi Sato is mainly at The Optronics Co,. Ltd.'s booth C1-102. If you wish to arrange a meeting, please contact us. Koichi Sato is looking forward to meeting you at LASER World of Photonics. Nihon Tokushu Kogaku Jushi Co., Ltd. (NTKJ) is delighted to announce that Koichi Sato, NTKJ's President, will be attending Photonics West 2013 at The Moscone center in San Francisco from 5th to 7th Feburuary 2013. Koichi Sato is mainly at The Optronics Co,. Ltd.'s booth #4911 in the North Halll. If you wish to arrange a meeting, please contact us. Koichi Sato is looking forward to meeting you at Photonics West 2013. Nihon Tokushu Kogaku Jushi Co., Ltd. (NTKJ) is delighted to announce that Koichi Sato is appointed as NTKJ's President, and former President Osamu Sato is now Chairman of the Board of Directors. "Producing the genuine" has been and will be NTKJ's policy in order to deliver quality optical components to our customers. NTKJ try to satisfy customers' needs with the cutting-edge production technologies and 38 years of experience in the industry. Koichi Sato, the new President, is looking forward to meeting you at CEATEC JAPAN 2012. Meet NTKJ at the CEATEC JAPAN 2012 in October! Nihon Tokushu Kogaku Jushi Co., Ltd. (NTKJ) is delighted to announce that we will present at the CEATEC JAPAN 2012 in October. Cutting-Edge IT & Electronics exhibition "CEATEC JAPAN 2012" will take place from 2 to 6 Oct 2012 at Makuhari Messe in Japan. NTKJ will exhibit various products and services. NTKJ will welcome you to our booth "2B43". Nihon Tokushu Kogaku Jushi Co., Ltd. (NTKJ) is delighted to announce that "LL0.7-0.5XL" has been added to our product line up. Nihon Tokushu Kogaku Jushi Co., Ltd. (NTKJ) is delighted to announce that "CF600-0.3", "CF700-0.3", "CF-20", "CF-50", "LPV45-0.1", "LPV60-0.1", "LPV65-0.1", "LPV70-0.2" and "LPV75-0.2" have been added to our product line up. Some Linear Prisms' product codes have been modified in order to represent prism shapes. 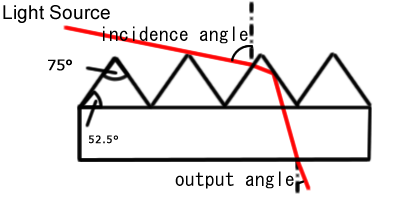 Products described by its "Peak angle" prefixed "LPV". Products described by its "inclimation from the lens holizontal surface prefixed "LP". Please refer to the product pages for more details. Although there were series of massive earthquake over Japan on 11th March 2011, Nihon Tokushu Kogaku Jushi Co., Ltd. (NTKJ) is expecting to operate our business as normal. However, we suspended all dispatch of orderd goods on the day of the earthquake as we could not confirm a situation of logistics in Japan. We have confirmed that all of our emplyees are not injured and manufacturing facility maintains its operating ability. We will update the lates news on the website. RHK Japan will also contact our customers who may be affected by the situation such as delivery delays. May we thank all messages of your sympathy and support. Nihon Tokushu Kogaku Jushi Co., Ltd. (NTKJ) is delighted to announce that various Fresnel lenses have been added in our product line-up. Please refer to our products pages for more details. If you sent e-mail messages during this period, and received error messages, please re-send your messages to us. Nihon Tokushu Kogaku Jushi Co., Ltd. (NTKJ) is delighted to announce that "LP75" has been added to our product line up. The new "LP75" is designed to bend light beam from a light source such as LEDs by reflecting at the slope of the LP75. A diagram below shows how LP75 bend light beam. As this diagram shows, LP75 has 75 degree apex angles with 52.5 degree inclination angles on both sides. A relation ship between incidence and output angle is stated below. LP75 size is 200mm x 200mm and 2mm thickness as standard. The standard material PMMA and thickness can be modified at small extra cost. Please refer to our products page for more details. Nihon Tokushu Kogaku Jushi Co., Ltd. (NTKJ) is delighted to announce that "LF15" ,"LF20"and "LF25 " have been added to our product line up. The new three products' can be used for lighting application and as a part of inspection devices. The new "LF15","LF20" and "LF25" are designed to collimate light beam from a point light source such as LEDs. These products lengths are 450mm in order to cover aligned LED lighting application. Nihon Tokushu Kogaku Jushi Co., Ltd. (NTKJ) will be in Summer holiday from 12th until 16th of August. We are still accepting enquiries via our website during this period, but replies will be after 16th August. Nihon Tokushu Kogaku Jushi Co., Ltd. (NTKJ) is delighted to announce that "CF150-B" and "CF600-B" have been added to our product line up. As a result, our fresnel lenses line up for solar concentrator range is from small to large sizes in order to satisfy our customers' needs. Nihon Tokushu Kogaku Jushi Co., Ltd. (NTKJ) is delighted to announce that "LF1000-BH" has been added to our product line up. LF1000-BH is a fractionized linear Fresnel lens and it has a focal length of 1000 mm. The size of one segment is 500 x 500 mm, and of 3 mm thickness, when two pieces are connected, they will form one 1000W x 500L linear Fresnel lens. Nihon Tokushu Kogaku Jushi Co., Ltd. (NTKJ) will be in Summer holiday from 13th until 17th of August. We are still accepting enquiries via our website during this period, but replies will be after 17th August. Nihon Tokushu Kogaku Jushi Co., Ltd. will be closed as below due to Japanese national holidays in May. We still accept enquiries via our website during this period. We will reply to enquiries soon after the holidays. Nihon Tokushu Kogaku Jushi Co., Ltd. (NTKJ) is delighted to announce that "LF150-B" has been added to our product line up. As a result, our fresnel lenses line up for solar concentrator ranges are for both circular and liner format in order to satisfy our customers' various solar application needs such as heat collector pipes and solar photovoltaics. Nihon Tokushu Kogaku Jushi Co., Ltd. (NTKJ) is delighted to announce that "CF50-B" and "CF400-B" have been added to our product line up. As a result, our fresnel lenses line up for solar concentrator range is from small to large sizes in order to satisfy our customers' needs. Nihon Tokushu Kogaku Jushi Co., Ltd. (NTKJ) will be in Summer holiday from 11th until 16th of August. We are still accepting enquiries from our website during this period, but replies will be after 17th August. Nihon Tokushu Kogaku Jushi Co., Ltd. (NTKJ) is delighted to announce that "CF1200-B2" and "CF1200-B3" have been added to our product line up. These lenses are ideal for concentrating solar energy. Nihon Tokushu Kogaku Jushi Co., Ltd. (NTKJ) is delighted to announce that The Wakasa Wan Energy Research Center (WERC) has adopted our large fresnel lens for their innovative solar furnace project. The solar furnace system is consist of our large 1300mm x 1300mm x t5mm Fresnel lens, which has been divided in 9 pieces. The furnace is able to produce more than 10kW/2500 °C at the focal point. Please refer to WERC's website for more project details. (http://www.werc.or.jp). Nihon Tokushu Kogaku Jushi Co., Ltd. (NTKJ) will be closed as below around Japanese national holidays in May. We still accept enquiries via our website during this period. We will reply to enquiries soon after the holidays. Nihon Tokushu Kogaku Jushi Co., Ltd. (NTKJ) launched the new website. Nihon Tokushu Kogaku Jushi Co., Ltd. (NTKJ) added short focal length Linear Fresnel Lens products to its line-up. Please refer to our products page for more details.